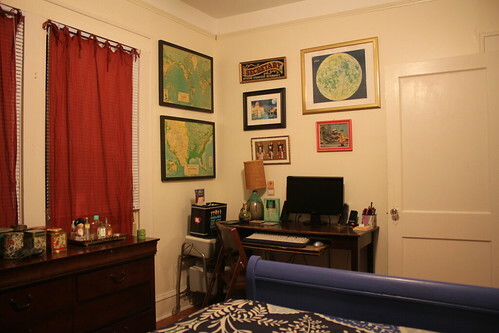 So I moved my "writing nook" [see it in its opening day glory]. And now it lives in [an awkward] spot in the dining room. The switch makes the energy in both rooms flow better. 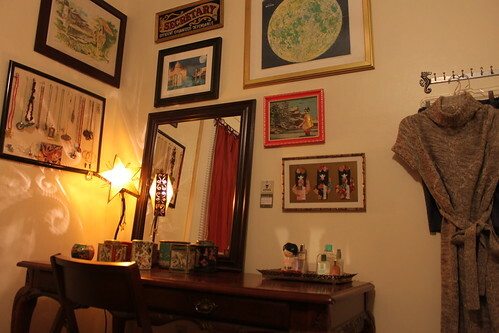 All details like my tin collection (holding toiletries), the art, and vintage mirror tray have been thrifted for over time. The table is a previously unused desk, it was in the dining room where my computer now lives. 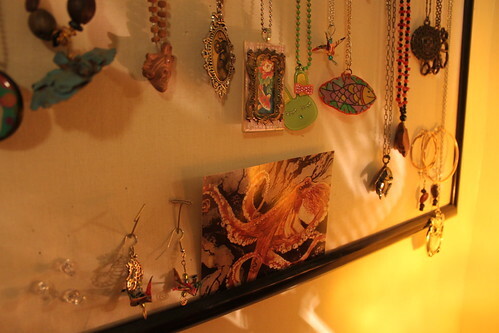 In a few minutes I carved out an inviting corner of the room. It's far from done, but it's already an alluring space to start my day. I love your collection of tins. I use something similar (with bags though) to travel with, and even if it takes more space than an efficient bag, they're prettier. Love the jewellery board. I need to figure out a frugal, travel-friendly jewellery storing and displaying option. Very nice job! 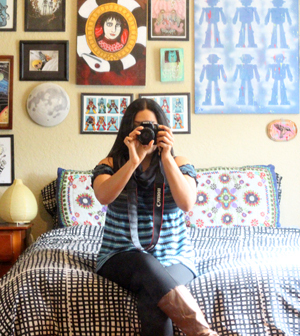 Come link up for a chance to win my Get Organized Giveaway! FB- I could see nesting fabric bags made of diverse fabrics as a pretty solution for toiletry storage. They all would zip up nicely into a bigger bag...hm, I need to make this! I see your little mirror vanity like mine! I'll have to try the harajuku lover's "Baby" at some point. As for catching some ZZZzzzz's what helps me is fluffy pillows and soft sheets. A nice weight comforter too. Makes it great for snuggling in. Amanda- thanks you for the suggestions. I need to improve the entire bed situation *greatly*. I really like the tins, too! 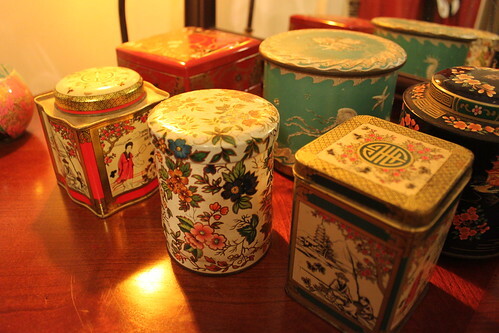 Did you see the vintage tin turned into candles DIY at Design Sponge? Mandi- I did see the DIY today, it's a beautiful idea I might have to try. Thank you for the detailed coffee-table instructions. The result of yours was so clean and simple, something I want to emulate. I love it. Very cozy. 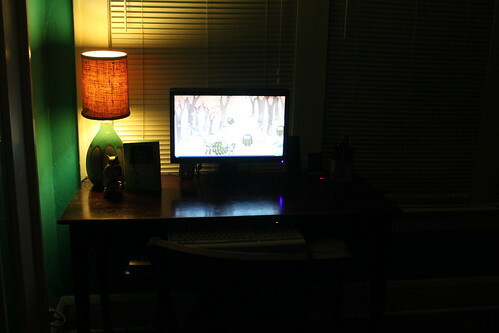 I love the warmth that lamplight adds, too. I love the warm light too! I wish I could paint the room to make it cozier, but for now, warm light will do! i've found that keeping my room less cluttered/messy helps me sleep. and also leaving my closet door closed haha. Katie: AND I'm working on the completely decluttered room bit. Considering melatonin, too. 'Cause, damn, something must be done about this sleep! Great tins and artwork! The melatonin really works and you don't have the drowsiness the next day. I take 1-3 mg, 1/2 - 1 hour before bedtime. I feel like a pharmacist! !